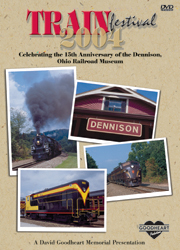 The Dennison Depot was acquired and restored by the town and turned into a comprehensive museum. In 2004 it celebrated its 15th year. This program is the official video coverage of all the festivities and events surrounding the depot’s anniversary celebration. From the 25 acre site full of steam and diesel locomotives and many more exhibits and vendors, to the wide variety of steam and diesel powered excursion trains, it is all here.